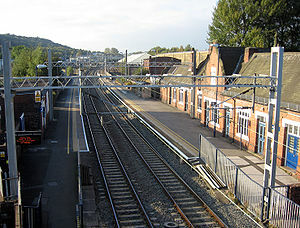 By train – Trains from Longport – Longport station is a 15-20 minutes walk from Burslem town centre and the train connection is five minutes from Stoke-on-Trent station, which is the mainline connection and less than 90 minutes to London. Longport station has been refurbished recently but is a little bit isolated if you are travelling alone. By bus – First Buses are the biggest operator and the Baker’s 77 Sunset Strip route also wends its glamorous way through Burslem. Other services pop up from time to time. Here’s a map of the bus stops in Burslem and some more information, if you can view it. While you eagerly anticipate a website that will tell you all of this rather more simply, Brief Encounters is a site where you can browse routes and write your travel stories. By taxi – Taxi firms – if you want to get a taxi from Stoke station to Burslem it is quicker to use the taxi rank by platform one but cheaper to call Magnum (01782 819819), a recent fare was £5.50. By canal – Burslem is close to the Trent & Mersey and Caldon canals and there is much industrial history to explore. Moorings are at Westport Lake or Etruria, with services at Longport and Festival Park. By bike – Burslem is very well connected to the national cycle routes and many new cycle routes have recently been added. If you’re up to the challenge, you can follow the gruelling route from Burslem that was the second stage of the 2010 Tour of Britain. The George Hotel is the only hotel currently open in Burslem itself. If you’re looking for a home, Burslem is very affordable. Try Gorgeous Homes for local rental properties too. If you want to make any additions to this information, please leave a comment below.